Remember the good ol’ days of Duke football? Yeah, us neither. But if Will Muschamp doesn’t get things turned around in Gainesville soon, winning football at the University of Florida will become the good ol’ days. Florida poaching Duke’s coaching staff. Looking to revive a sluggish offense — and perhaps save his job beyond next season — Muschamp hired Duke offensive coordinator Kurt Roper to take the same position (and to coach QBs) in Gainesville. The move was first reported on Tuesday; the school made it official Thursday, while Roper was in Atlanta as the No. 24 Blue Devils prepare for Texas A&M in Tuesday’s Chick-fil-A Bowl. To Roper’s credit, his success came long before his six seasons at Duke. He coached at three SEC schools from 1999-2006, most notably serving as Eli Manning’s QB coach while at Ole Miss and Arian Foster’s RB coach at Tennessee. "He has a diverse, up-tempo background on offense and does a good job of adapting to what the players do best," Muschamp said of Roper on Thursday. "The most important thing, though, is he has always remained balanced. He has had success calling plays in the SEC and has tutored three NFL quarterbacks. He has had players produce at every offensive position and he is one of the most well-respected coaches in the country." Well, Duke quarterbacks Anthony Boone (7) and Brandon Connette (18) sure love QB coach and offensive coordinator Kurt Roper after the game. Florida is hoping its QBs feel the same way next season. On the other side of the coin, one would understand if Duke head coach David Cutcliffe was left devastated. Roper was a finalist this season for the Broyles Award, given annually to the nation’s top assistant coach. He helped turn the Blue Devils into one of the ACC’s better offenses, averaging more than 400 yards and 31 points per game this season. And he’s been with Cutcliffe since the 90’s. 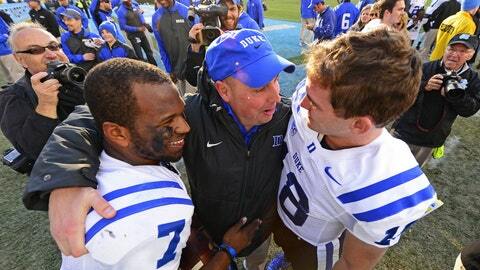 So how did Cutcliffe mourn the departure of his top assistants on Thursday? To Cutlcliffe’s credit, he is allowing (OK, maybe begging) Roper to stay on and coach the Blue Devils in their bowl game. Oh, and about those good ol’ days? This isn’t the first time Florida has turned to Duke for a football coach.